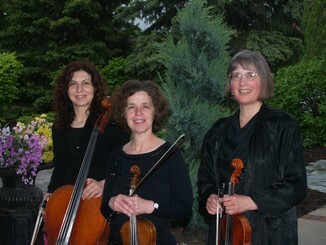 TRIO CAPRICCIO was formed in 1992 with violinists Paula Shaw and Barbara Lapidus, and pianist, Judith Esch. We had so many requests for string trio music that we have added cellist Petia Kassarova and today play almost exclusively with three strings. We also play duos and quartets upon request. We have played many weddings, receptions, bar mitzvahs, memorial services and other occasions. Among the varied performances we have given are school, church, and campaign fundraisers, a recital on a noontime series in Troy and workshops in Memorial Chapel at Union College for music classes. Recently we have performed for special events at Union College, the Glen Sanders Mansion and the Hall of Springs in Saratoga Springs. We play in Albany, Schenectady, Troy and surrounding communities.